Ask for assembly of this item for R3.30? Categories: All, Fastening Elements [2.x...], Hole Reducer Bolt [2.51.x...], Machine Guard Systems, Modular Assembly Systems, Standard Unit. This product is a hole reducer bolt, used for fastening purposes. 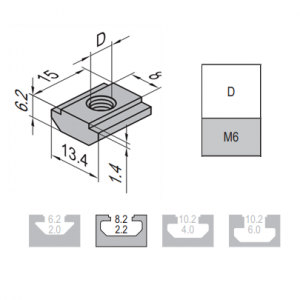 The reducer bolt is used to reduce the hole diameter of the profile and improve the thread connection strength. Therefore, its essential for sturdy connections between profiles. The bolt screws into the strut profile and once properly fastened, can be used to connect another profile to the current profile. A part of the bolt will be extruding from the profile, and this will be screwed into the second profile. Finally, once completed, the connection produced is extremely sturdy and and reliable.